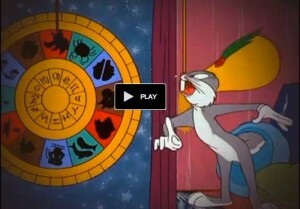 From the 1949 cartoon “Bowery Bugs,” Bugs Bunny plays the role of an old-time NYC fortune teller and says “23 skidoo” to prove his early 20th century bono fides. Scene occurs around 4:20 minutes into the short. And while use of “23 skidoo” has pretty much faded by now, there is still one place – one mega-city in fact – where plenty of people of all ages are still familiar with the phrase and are more than happy to tell you about how the expression came about. Watch “What Happened on Twenty-Third Street, New York City.” (1901) And no, that is not Marilyn Monroe’s grandmother. Though this short film predates the Flatiron building by a year or so, it does illustrate that time period’s predilection for a certain type of female sartorial mishap. “Skirt blowing action” begins about one minute into this short film by Thomas A. Edison’s studio. Ask almost any New Yorker, and they’ll inform a newcomer that “23 skidoo” has everything to do with Manhattan’s Flatiron Building, a triangular 22-story skyscraper built in 1902. The Flatiron Building, an impressive structure then and now, is located on 23rd Street at the confluence of Fifth Avenue and Broadway. Because of the building’s shape, the open spaces of Madison Square Park (which it faces), and the sharp angles of the building-lined streets that border it, the Flatiron Building — till this day — experiences a continual, ever-shifting swirl of high winds and downdrafts. A 1905 postcard from New York City. Its location is established by the Flatiron Building in the background. How Windy is This Location? 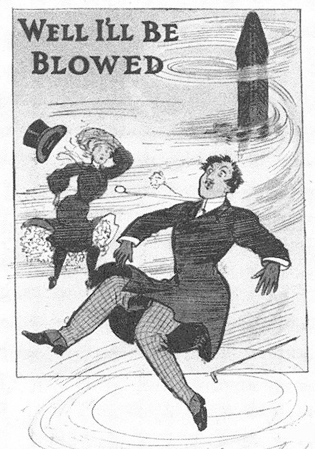 Windy enough to attract idle groups of young men who, back in the day, would wait to catch sight of a lady’s well-turned ankle or leg exposed by the gusts. Police would be called. And then New York’s finest would proceed to break up the gawking males with cries of “23 skidoo!” — with “23” for 23rd Street, and “skidoo” a derivative of the slang word “skedaddle,” meaning to leave abruptly. Hence, the Origin of the Expression. But like my fellow New Yorkers, I’ll still stick to the meteorological account for the phrase; it has everything Big Apple dwellers like in a story – Naughtiness! History! Law-breakers! Cops! And tall buildings. 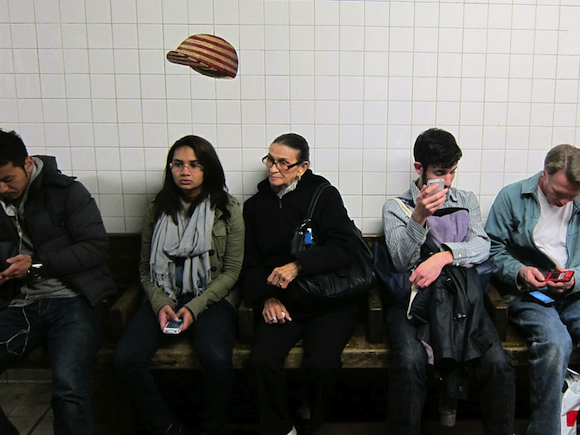 A striped cap, actually a mosaic depiction, seems to float above waiting passengers at the 23rd Street subway stop. Other images of head wear appear on the station’s white tile walls in reference to its windy location. This entry was posted on Saturday, April 11th, 2015 at 7:54 pmand is filed under . You can follow any responses to this entry through the RSS 2.0 feed. You can leave a response, or trackback from your own site. Thank you for the informative article. I was just looking up things with the number 23 in them, like this saying and the song Strawberry Letter 23…. Wow. “Strawberry Dream 23”, I haven’t heard that tune in a long time. My favorite cover of it is by the Johnson Brothers, produced by Quincy Jones in 1977. To hear it, go here — https://www.youtube.com/watch?v=XgsJLGQTfEE — and it is eminentally danceable. L.A R&B artist Shuggie Otis originally wrote and released the tune in 1971, giving it a lighter “pop” feel, while young rapper Tevin Campbell gave it a energetic “New Jack” beat in his 1991 version — https://www.youtube.com/watch?v=DwgprId0mQk — the significance of “23” in the song’s title beats me. Skidoo is also a 1968 movie directed by Otto Preminger with an all-star cast and a plkot about hippies and LSD. I’ve only seen the trailer-not sure if 23 appears. There is the infamous ’23 enigma’ though…some odd occurrences associated with it. It may have even rated an X-Files episode. Certainly few Americans under 65 employ the term today. Seems to have a lot in common with the very similar ‘skedaddle’ too.